Chocolate and wine are the perfect paring. Taste handmade, gourmet truffles and chocolate paired with select wines and tour some of the Patapsco Valley region’s vineyards. Love wine and chocolate? Look no further! This tour offers this perfect pairing of the two delectables. On this chocolate and wine tour, your Maryland wine is paired with handmade, gourmet truffles and chocolate. 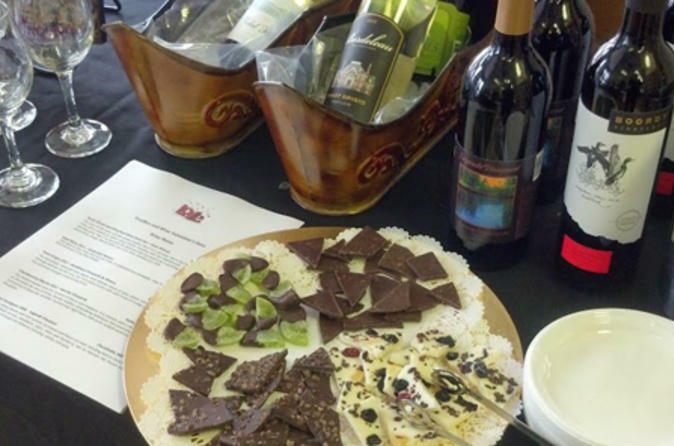 You will learn all about the perfect pairing of chocolate along with your wine tasting at a Maryland vineyard. Your visit includes a tour with one of the vineyard's knowledgeable winemakers. Boordy Vineyards, Basigani Vineyards, Fiore Vineyard & Winery, Harford Vineyard, Legends Vineyard, Royal Rabbit and Millstone Cellars are among the places you can enjoy your tasting, depending upon the winery's availability. You will receive a collectible wine glass and a tote bag as a souvenir. Make sure to take full advantage of the 15% discount at Parfections shop, which provided the delectable chocolates for your tour, and bring some delicious confections home with you. Your tour ends at 4:30pm at which time you are returned to your original departure point.